The Lamborghini Huracan is one of the most amazing and famous supercars in the world and owning one, tweaking it with a cheap yet standout body kit and then selling it for extra cash, seems to be a very lucrative business for lots of rich and famous folks out there. 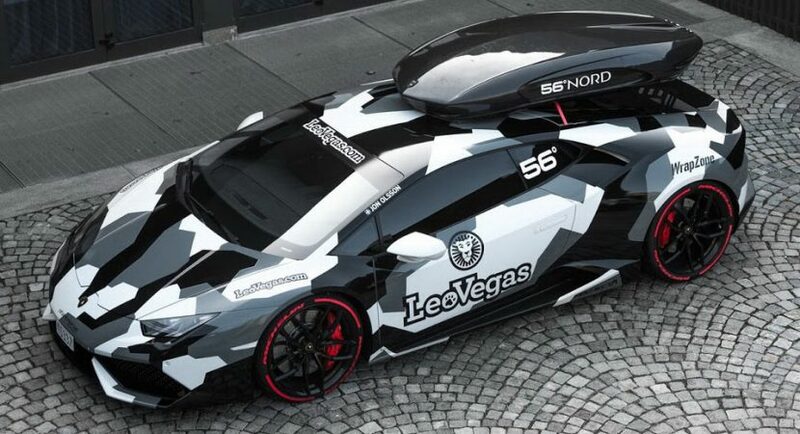 It might be also the case of famous Swedish skier Jon Olsson who is currently finding a new owner for the outstanding Huracan seen in the video below. Jon Ollson is advertising his ride on Instagram, asking a price of $269.000. The supercar comes with a nice carbon fiber aero kit, yet highlighted by some body parts that have nothing to do with a supercar aerodynamics. The car`s main highlights refer to the extremely prominent fenders and side skirts, bespoke front and rear bumpers, adding as well roof-mounted ski box, mounting points, all proving to make the supercar more practical in different situations. I personally find it too exaggerated and spoiling its overall personality. The Lamborghini Huracan has also received some hefty modifications under the hood as well, meaning that the 5.2-liter V10 engine is now churning out more than 800 horsepower, thanks to the new turbochargers and ECU remapping. Even if we do not have the official performance figures, we bet this lad here can sprint from 0 to 100 km/h in less than 3.2 seconds. You can find out more details about the Lamborghini Huracan in the video below, which indicates that this might be the fastest Huracan in Europe!